Propellants and oxidizers can be produced in modular plants near your rocket launch site. 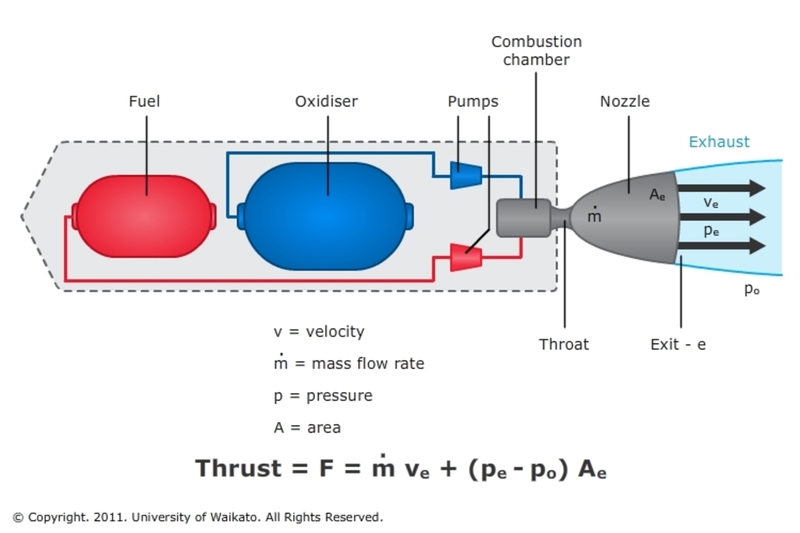 The combustion of the fuel generates thrust at the end of the rocket nozzle. After 90 years of development, further engine refinements just aren’t expected to lead to major improvements in terms of thrust. The heat of combustion of the fuel is all the energy that can be released. The general public may think that ion propulsion is the subject of a science fiction thriller. Yet NASA has used the ion propulsion system on the Dawn space probe, currently in orbit around dwarf planet Ceres, which is the largest object in the asteroid belt. Photos can be found hereof the mysterious bright spots. Dawn with its ion drive is the first spacecraft to enter and leave the orbits of multiple celestial bodies. The ion drive engine is a thruster where molecules of an unreactive fuel, such as xenon, are given a positive or negative charge (“ionised”) and accelerated by an electric field to be shot out the back. The thrust is quite low, equivalent to the pressure exerted by a sheet of paper on the palm of your hand, therefore, an ion engine is very slow to pick up speed. However, over a long-range mission, it can deliver 10 times as much thrust per kilogram of fuel than that of a chemical rocket. These engines are like the super charged versions of the ion drive. Instead of a non-reactive fuel, magnetic currents and electrical potentials accelerate ions in plasma form to generate thrust. It’s an invention that is half a century old, but it has not made it to space…yet. The most powerful plasma rocket in the world is currently the Variable Specific Impulse Magnetoplasma Rocket (VASIMR), being developed by the Ad Astra Rocket Company in Texas. Ad Astra calculates that it could power a spacecraft to Mars in 39 days. And now we go into the realm of the fantastic. Antimatter is made of antiparticles, which have the same mass as particles of ordinary matter but opposite charge and spin. Electrons are normally negative and protons are positive, however, in the world of antimatter they are the opposite. In 2006, the NASA Institute for Advanced Concepts (NIAC) funded a team by Dr. Gerald Smith of Positronics Research, designing an antimatter-powered spaceship. Positronics Research calculated just 10 thousandths of a gram of antimatter would be enough to send a ship to Mars in 45 days. The problem is generating enough fuel and then a containment system is needed. Unless a source of this superfuel is found, antimatter engines will likely always remain in the realm of science fiction. Well we can dream!!! Do you need a modular plant to produce a propellant or an oxidizer? Let COSTELLO help you with your modular plant.